Headquartered at the beautiful archipelago of Seychelles, First Binary Option Service extends their brokering services to their global clients. The company claims to fully meet the requirements as set by the “Seychelles International Business Authority (SIBA) Act” of 1994 and also claim to be regulated by the SIBA. However, they do not provide any license number to claim the status of the regulation. First Binary Option Service provides their specific web based trading platform. The good news is that demo account is available with them so that one can gain some familiarity of their platform before investing money with them. However, the minimum deposit amount is only 5 units and thus many traders may not mind to fund their account and explore the live trading opportunities with them. One can fund their account in three different currencies of dollars, euros and rubles. They maintain a minimum trade size of just one currency unit which is very much affordable even for a small or new investor. Large investors do not need to worry either. First Binary Option allows you to invest up to maximum $1500 in a single trade. If you think you are experienced enough to invest such a big amount, you can opt for it. First Binary Option provides around 50 trading instruments of different types including currency pairs, futures, indexes and CFDs to their traders. 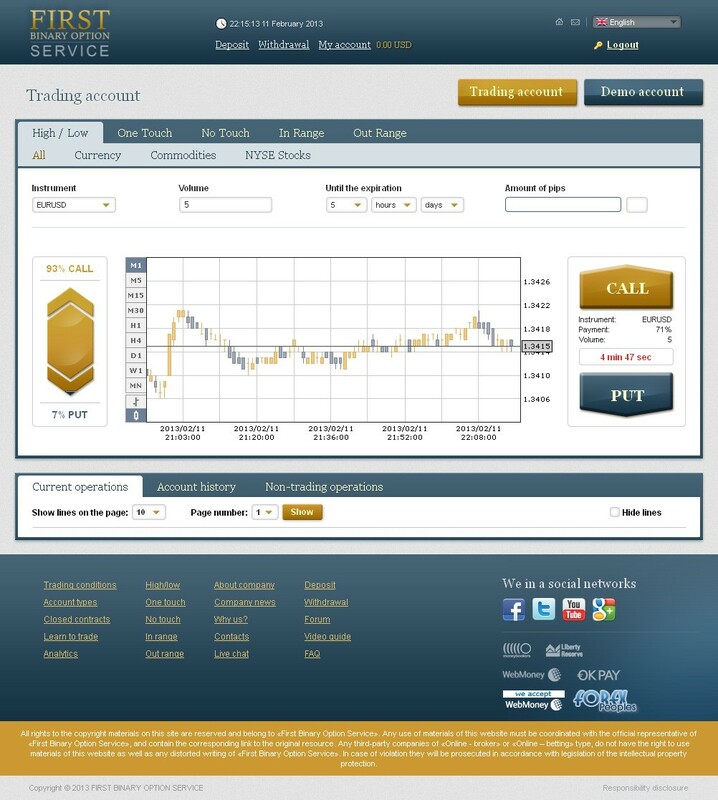 The company’s trading platform offers a web based interface and a trader needs not to download and install any software onto their computer system. The company has been online since 2011 and they offer support in English and Russian languages. First Binary Option does not offer a very long list of instruments to their traders. They have only 46 trading instruments from different markets. However, they allow funding of account with a minimum amount of just $5 which can draw the attention of many traders. One can start trading with just one dollar and at the same time, a trader can enjoy an out of money reward of 15%. This shows how affordable broker they are and why any new trader will find it easier with them to explore the online trading opportunity of various financial instruments. They offer a payout between 60% and 80%, and hence besides being affordable, First Binary Option offers a fair earning opportunity to their traders. However, they do not offer any bonus opportunity to their traders. So, your earning will solely depend upon your talent of predicting the market movements of the assets that they have in their portfolio. With First Binary Option, besides investing in the traditional binary options of high & low, there are several other trading opportunities which can help a trader to make lucrative earnings of up to 765%. For example, one can use their “One Touch” option to trade assets, which is further subdivided into two contracts: “Up” and “Down”. Here, investors have different levels of earning opportunities for different assets. One can also take advantage of their “No Touch” option which can guarantee them an earning of 45% on assets. Their “In Range” opportunity is for all those who want to multiply their investment fast and can seek around 300% of return by investing In Range. Their Out Range can help you to earn a 10% return within a certain time period. First Binary Option provides analytics and Yahoo Finance News to its traders. The analytics brings positive and negative news from various markets, allowing traders to understand the market movements and thus to make their trading decisions accordingly. Besides providing these news snippets, they do not offer any other kind of technical tools to their clients. One can take help of their Demo Account to gain more insight about their trading platform. However, real trading can be very challenging for the newcomers if they do not get sufficient guidance from their brokers. Today, most brokers want their clients to make money through them and this is the reason these brokers provide with a host of technical tools such as historical data and charts to the traders. No doubt, they are pretty affordable with their minimum deposit level of just $5, but nobody wants to lose his single penny. And thus, they must think of offering high-end analyses so that traders can feel more comfortable while investing even their $5. Again, their Demo Account will be more useful for anyone willing to learn how to use their trading platform. They however have a video guide that can help understand everything about binary options trading and their trading platform. One can also refer to their Learn to Trade section on the website to understand how to trade with them in a step by step manner. Moreover, one can visit their Forum section also to take part in the ongoing discussions taking place between various members. One can gain practical insight here as members often share their personal experiences. You can also post your queries on the forum for the experienced traders to answer and clear your doubts, if any. So, this is a very good feature and it is recommended for the newcomers to learn from what the pros of the industry are sharing in the forum. 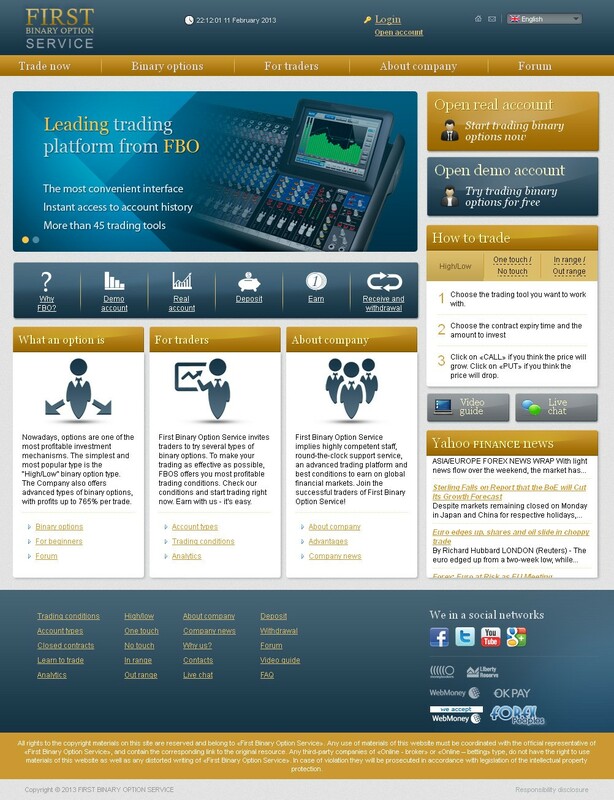 Besides they have detailed beautifully all the trading options on the website that they have for their traders. For example, one can learn what is “No Touch” and how one can use it to make profits. In the name of support, they have e-mail and online chat services. But they do not provide you with any phone number, if you want to call them. There is not a single phone number mentioned anywhere on their website. However, their online chat feature is fully functional and a courteous customer support guy will always be ready to assist you. For a beginner, First Binary Option can be a good option, considering their low investment level and a fairly significant earning opportunity ranging between 60% and 80% for their regular binary options. They offer a demo account to a beginner and probably a newcomer may not have any qualms in doing business with them. But there are few things that put a question mark on their credibility. First, they claim that they have been regulated under SIBA but fail to provide with any license number. And the important thing is that they do not mention any phone number or a physical address on their website. So, a trader while making an investment like 1,000 dollars will think twice to use their brokerage services. DO NOT USE THIS BROKER!!! It took over 3 months and many live chat sessions to get my money back. There are many other good brokers out there, please do not use this one. Save your self the headache. Also traders from the USA are not accepted. I work with OptionTrade and i see lots of advantages compared to others. They have many nice options and their own signals and their support is good. Other brokers can’t offer what they do. I’m trading with firstbinaryoption for almost a year and I actually like them especially the high number of currency pairs and expiry times. I agree with you. The flexibility setting the expiration date and the number of currencies is not offered by any other broker. This is brilliant for a good strategy. After trying the demo account I was able to earn a lot of money. I already started the registration process in a real account but I’m a bit worried about lack of regulation. Plus Sean’s review…, did you have any problems with your withdrawals? Excellent broker! I work with First Binary Option for 2 months and I have no problem with that. I think this is the most important thing that withdrawal is fast. I have no problems obtaining withdrawal from First Binary Option. If I need help, they always reply to emails, their support is really good. I use signals and it is really helpful. SCAM! Dont use this broker! 2 weeks they didnt answer about my withdraw. It’s not a fraud. This is not about easy money. You need to work hard, learn the resources and use your head. If you want to make a quick buck, you will lose. I trade with first binary option for 2 years and I want to say they are really great. Their system is simple and their withdrawal is faster than others. I like it.